We have the best Reptile Shows and Kids Parties! Why did everyone else say that Snakebusters® are Australia's best reptiles? It is almost unheard of for competing traders in an industry to gang up on the market leader and go to court claiming that the market leader is better than them. It’s less uncommon for traders to seek government help in “levelling the playing field” against a business rival who has an unassailable competitive advantage, but it has happened before. This is what happened in the lead up to and during VCAT proceedings in Victoria in 2008 involving Snakebusters. Less experienced wildlife demonstrators all complained that they were struggling to get clients because Snakebusters were so much better than them. The proceedings were about getting the Victorian Government to impose regulations on Snakebusters in order to lower their standards to allow others to compete against Snakebusters. In essence the Victorian government wanted to restrict Snakebusters and their use of devenomized snakes in hands on reptile shows. At the time, Snakebusters were handing out devenomized Jaffa Snakes to people to give them a “once-in-lifetime” experience of handling mega-deadly snakes risk free. The devenomized Jaffa Snakes were a Snakebusters exclusive, that no one else anywhere in the world could match. The Snakebusters argument that others should improve their standards to match Snakebusters was rejected by the government on the basis that it was impossible for them to do so. In order to “level” the playing field, a few years earlier, the Victorian Wildlife Department (DSE) had outlawed venomoid surgery (devenomizing) on snakes. While the target had been Snakebusters and Raymond Hoser (the only people with them), the rule change actually hampered everyone else. You see Snakebusters already had lots of venomoid snakes and because laws can’t be made retrospective, Snakebusters continued with business as usual. However no other wildlife demonstrators were able to use the methods first used by Hoser to get their own devenomized snakes. This meant that Snakebusters had what the DSE called an “unfair” competitive advantage. Snakebusters could cart deadly snakes to shopping malls in total safety while less expereinced rivals could only dream of it. And so the VCAT matter was about redressing this unbalance. Snakebusters argued that venomoids were good and that with Raymond Hoser as the expert on such things, he should be listened to. Hoser called for the banning on the procedure to be lifted and also for other demonstrators to be prosecuted when they put public safety at risk using snakes in public that were dangerous and not venomoid. DSE and the others demonized venomoids and said the banning of the procedure was good. They went further and demonized all forms of hands on with reptiles, mainly because almost all the expert witnesses who made statements for Snakebusters supported these things and DSE’s lawyers sought to undermine Hoser’s recognised and unrivalled expertise and credibility. On the basis of these unanimous sworn legal statements from everyone to the effect that Snakebusters were “Australia’s best reptiles”, because of both the venomoid snakes, as well has Hoser's unmatched expertise, which couldn't be legislated against, Raymond Hoser then applied for the trademark, “Australia’s best reptiles”. In the first instance, the claim for the trademark was rejected. Hoser was asked to prove he and his company Snakebusters were in fact “the best”. This so called “adverse report” would normally be the end of the road for any attempt to get such a trademark. A “words only” trademark, using a term such as “best” is almost unheard of, because it’d be almost impossible to be able to get statements from competitors in an industry lining up to claim that one particular company (applying for such a trademark) was so much better than them and should get legally enforceable exclusive rights to claim they are the best. However armed with the VCAT case statements and a raft of other evidence, Raymond Hoser was able to show the trademarks office that yes, everyone who mattered in the reptile industry and who knew things, all said Hoser’s company was the best in all things reptiles. Hence Hoser got the registered trademark, Australia’s best reptiles. 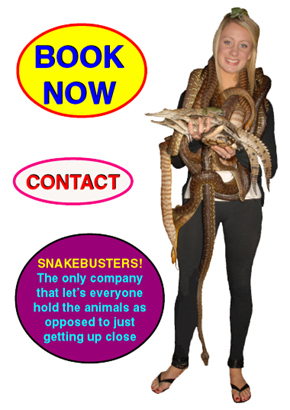 The trademark’s "claim" was “wide” and included pretty much everything, with Snakebusters successfully proving they were the best in Australia for reptile shows, snake shows, wildlife shows, snake catching, snake handling, venomous snake handling courses, school wildlife incursions, kids reptile parties, reptile displays at major events, publishing accurate information on reptiles and more. Because all the other companies, DSE and VCAT all demonized “hands on reptiles” as practiced by Snakebusters, as well as our educational kids parties with reptiles. (The VCAT judge, Anne Coghlan claimed “hands on reptiles” by Snakebusters and our kids reptile education parties were nothing more than a circus, a claim widely repeated by DSE and other demonstrators), Hoser’s application for the hands on reptiles trademark (first rejected), eventually made it through the adverse report process, as did a series of "Reptile Party" and "Reptile Parties" words trademarks. You see another reason to reject a trademark is if other traders in an industry would be likely to use such words or trademarks. The VCAT proceedings showed that not only were all the other wildlife demonstrators in Australia against hands on reptiles, and taking reptiles to kids parties, but that their opposition was vehement. Contrary to the opposition to "hands on" wildlife shows was teachers from the best schools, most other educators and leading wildlife scientists who unanimously endorsed Snakebusters and their education of children as being "the best", as well as statements from over 10,000 other people in written "testimonials" and the like which eventually helped push the trademark registration over the line. 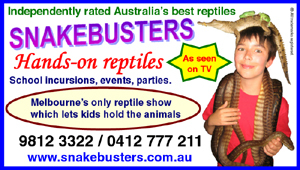 Now that Snakebusters has registered both trademarks, "Hands on reptiles" and "Australia’s best reptiles" as well as similar relevant phrases such as "Reptile party" and "Reptile Parties", and been demonized by less experienced rivals for these activities, there is no way Snakebusters would now allow them to bootleg the trademarks a few years later for the purpose of stealing Snakebusters clients or potential clients who seek to have hands on reptiles shows as done by Snakebusters. 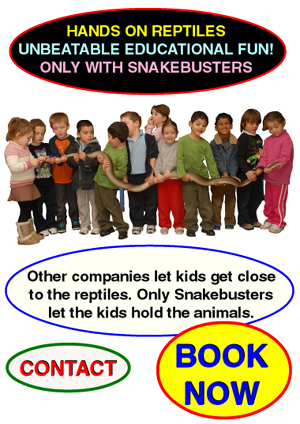 This is particularly so as “hands-on” by Snakebusters means people can "hold the animals" (another of many alternative phrases we own the registered trademark for), while “hands on” as described by the imitators at best may mean, merely touching a reptile for a few seconds. The same applies in terms of people who purchase a $70 business name one day and then erect a website claiming to be “best” the next. Snakebusters won’t allow that either and with the registered trademarks, Snakebusters now has the legally enforceable powers to stop bootleggers in their tracks. For the benefit of school teachers, parents and others, it’s important that they know who is actually the best in Australia’s reptile education business and who does proper hands on with reptiles. That’s why Snakebusters will remain protective of our trademarks and other intellectual property. © 2015, Snakebusters®, independently rated as Australia's best reptiles®. All Rights Reserved.